What happens when you go over your plan's daily pageview limit? Did you become a customer before September 4, 2017? If you became a customer before September 4, 2017 you might be benefiting from a previous version of our plans and pricing. What does each plan include? Up to 2,000 daily pageviews. Up to 10,000 daily pageviews. Different rate options from 20,000 daily pageviews to 15 million. How many heatmaps can I have? 3 at one time. You can delete old ones to make room for new ones. How many pageviews can each heatmap have? How many recordings can I have stored? 300 at one time. You can delete old ones to make room for new ones. How many recordings can I generate at one time? How many forms can I track at one time? 3 forms at one time. You can delete old ones to make room for new ones. How many sessions can I track for each form? How many funnels can I have set up at one time? 3 funnels at one time. You can delete old ones to make room for new ones. How many sessions can I capture on each funnel? How many feedback tool widgets can I have at one time? 3 of each kind. You can delete old ones to make room for new ones. How many responses can I get to widgets? Learn more about data retention here. Analytics Tools: 365 days from the date the data was collected. What happens if I have more pageviews than the plan allows? 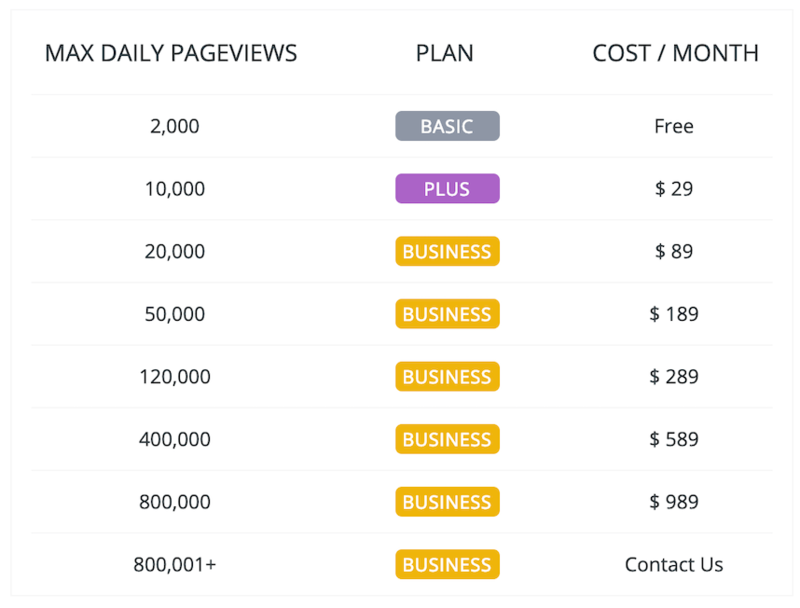 If your site gets more pageviews than the plan limit, Hotjar will collect data from a sample of your site’s daily traffic. There are no overage charges.